Kristen Schellhase (center), program director for the Athletic Training Program, and Patrick Pabian (fifth from left), program director for the Doctor of Physical Therapy Program at the University of Central Florida, stand with physicians and physician assistants from Orlando Orthopaedic Center, Timber Creek High School athletic trainers and students, Orlando Sports Medicine physical therapists, UCF athletic training students and UCF physical therapy students. The group has provided low-cost pre-participation examinations to area student-athletes for the past five years. First-year students in UCF’s Athletic Training Program take a clinical skills class where they learn functional knowledge of human anatomy, advanced taping and bracing skills, and clinical assessment of general medical conditions. The students practice on each other and gain experience working with patients in clinical experiences in the community during their studies. 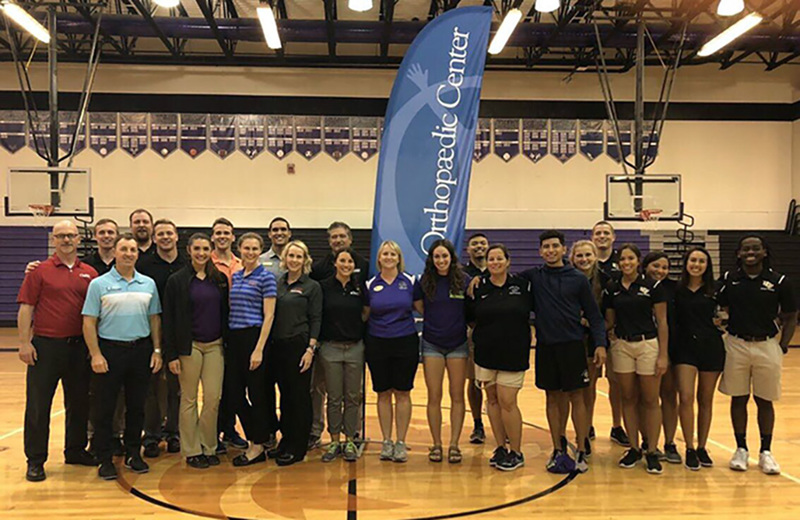 For more than five years, UCF athletic training students have partnered with Orlando Orthopaedic Center Foundation, the philanthropic arm of Orlando Orthopaedic Center, to provide annual sports physicals for area high schools, club teams and Seminole State College. The foundation offers the physicals — also known as pre-participation examinations —to student-athletes April through June at various locations throughout Central Florida, and donates 100 percent of the fees to each high school’s athletic program. Michelle Bruno, an athletic training student, performs a vision test on a student at Boone High School. Andy Reber ‘03, the center’s sports medicine outreach coordinator, organizes the sports physicals, including the recruitment of physician and other clinical volunteers for approximately 2,000 student-athletes each year. UCF students also have benefited from scholarships provided by the foundation to further their studies, while area athletic trainers are provided continuing educational opportunities twice a year, said Schellhase, who is also a board member of the foundation. Zya’Nel Moorhead McKie is the recipient of the Orlando Orthopaedic Foundation scholarship this year, Schellhase added. 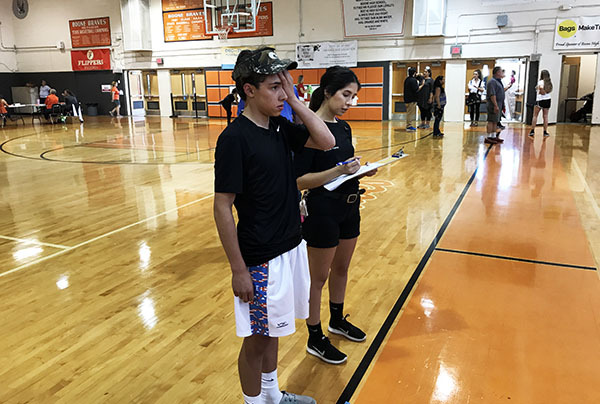 During the sports physicals, students perform vision tests, height and weight measurements, blood pressure and pulse assessments, and musculoskeletal screenings. The musculoskeletal screening includes an assessment of range of motion, strength, alignment and biomechanical function. Student-athletes with a history of injury or a concern on a musculoskeletal screen are flagged for further evaluation. The students are also tasked with obtaining and recording the athlete’s health history, and alerting a supervising clinician to any anomalies in the health assessment. The student volunteers have performed these screenings before on other class members as part of their training. Reber said the students are excited for the additional opportunity to interact with “real” patients.